The first Test match in India since last month's terror attacks in Mumbai provided a thrilling finale with all four results -- victory for either side, a draw or a tie -- possible going into the final session. Batting maestro Sachin Tendulkar's unbeaten 103 as India achieved the fourth-highest run chase in history to stun England by six wickets in the first Test here on Monday. Tendulkar, swept off-spinner Graeme Swann to fine-leg for the winning boundary that also brought up his 41st Test century amid loud cheers from 30,000 home fans at the Chidambaram stadium. 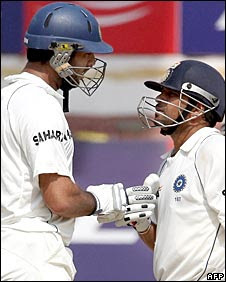 Yuvraj Singh, recalled to the Test side following the retirement of former captain Sourav Ganguly, scored 85* in a fifth-wicket stand of 163 with Tendulkar to dash Kevin Pietersen's men dominated a major part of the match with both bat and ball. Tendulkar, showing the form that has made him the all-time leading scorer in both Tests and one-day cricket, anchored India's chase for five hours in which he hit nine boundaries. The second Test starts in the northern town of Mohali on Friday.